Keep your most valuable glassware organized and easily accessible with this overhead stemware rack. This rack has a durable black powder coat finish that will blend in with any decor. It’s super easy to install and features eight full-sized channels so you’ve got plenty of room to manage all of your delicate stemware. Stop wasting money by putting your most breakable glassware in harm’s way. 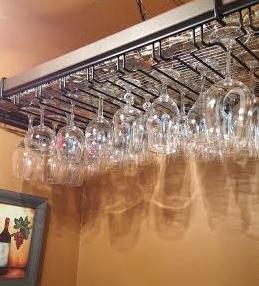 Install this overhead stemware rack in your space and keep your glasses safe and handy at the same time! We just completed a newly converted a unused half bath into a wine room. and this rack was perfect for the space. I built a frame and attached metal mesh to it like a hammock and if you look closely you can see it now is used for collecting corks. It was one of the few places that had this in the size and color I wanted. And the Chat option from Kegworks worked great. They were so helpful and the site states Hassle Free Returns. How is this fastened under the cabinet? I see no mention of how to mount. BEST ANSWER: The rack has 4 U- shaped "hooks" welded to it that provide about 3 inches of clearance from the ceiling surface you are attaching to (a little hard to explain ) There are screwholes at the top of each hook. Not hard to install,but an extra pair of hands is helpful. Just make sure you're not trying to hang this from a ceiling way above the rack because it only hangs 3" down. Has "eyelets" in small legs / stand offs constructed of the same material as the rack itself. Was a bit odd, at least on the unit I received, that the standoff a were not the same length in front vs in back. Had to attach through 3/4" thick blocks/shims to level unit. It may not fit under regular cabinet. It is huge. Check diagrams 4 on website. It has 4 mounting brackets on top. I mounted it on my bar ceiling. About how many stemware glasses does this hold? BEST ANSWER: Hi Julie, the amount of stemware glasses it holds depends on the type of glasses you're storing. I would suggest measuring your glassware at its widest point and divide the depth of this rack (15.25") by the width of your glasses for an approximate number of glasses that will fit per channel. Cheers! What is the dimension between the mounting hooks and how far in from the edge are the mounting hooks?